Plaid shirts are considered fall and winter staples. Everybody could rock this statement shirt all-year around since they are also versatile and can be worn in so many different ways. The plaid shirt is considered the off-duty, whether you’re wearing it with casual jeans or classic pieces like suede boots and more, below are fresh and fun ways to wear your plaid shirt this fall and winter. Here’s the easiest chilly day outfit – plaid shirt, plain tee, skinny jeans or leggings and slip-on sneakers. This is a very laid-back ensemble perfect for casual days and the weekends. Sport an effortless look by adding a vest to your outfit mixed with brown boots and leggings with your traditional plaid shirt. So many colorful plaid shirts would look extremely stylish when you pair it with white jeans. 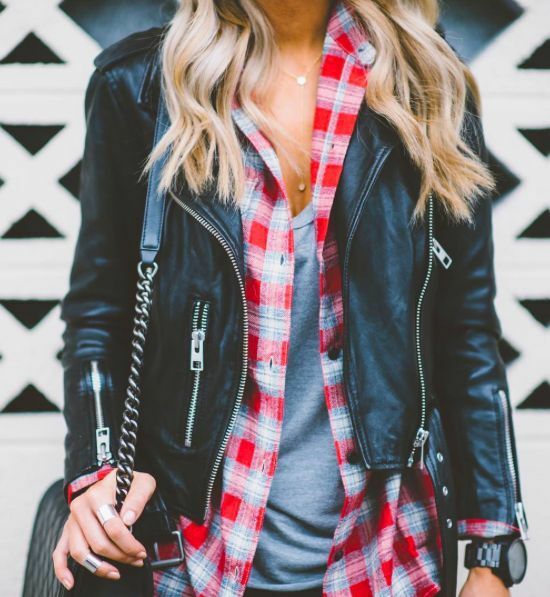 Layer a leather jacket over your unbuttoned flannel shirt and gray tee for added texture. A very badass look. A tight dress would look amazing with your loose flannel shirt. Complete your getup with sheer stockings, knee-high boots then you’re good to go for a night out or a concert. This is a slightly elevated look than the traditional plaid shirt style outfit. Make your plaid shirt look more smart and professional by adding a cardigan to your look or a sharp blazer. Depending on how professional you want to look, add a pair of slacks and high heels or denim jeans and suede boots work best too. Another easy way to style your favorite flannel shirt is by mixing it with black jeans and brown leather boots. The perfect autumn and winter ensemble. Forget jeans! 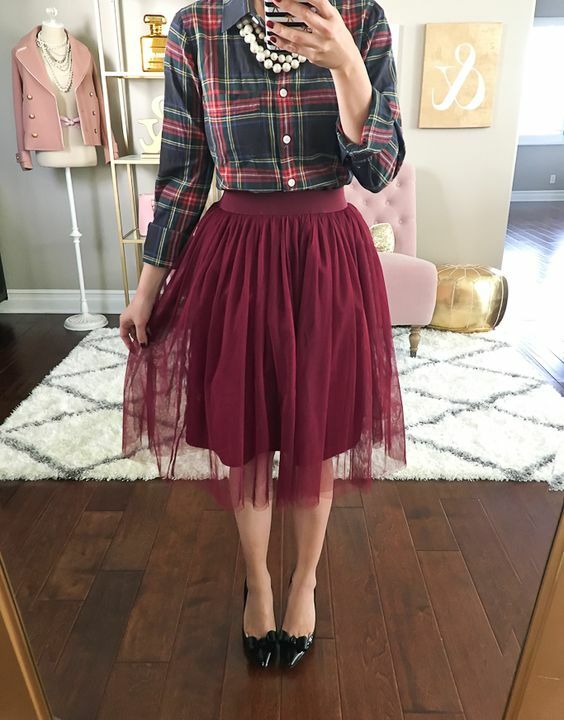 Tuck your plaid shirt into a skirt – a tulle skirt to be exact, to create a stylish and glamorous look. Finish off your ensemble with a nice pair of high heels. Create a statement-making ensemble by mixing textures – plaid shirt, leather pants and denim jacket tied around the waste for that chic and edgy effect. 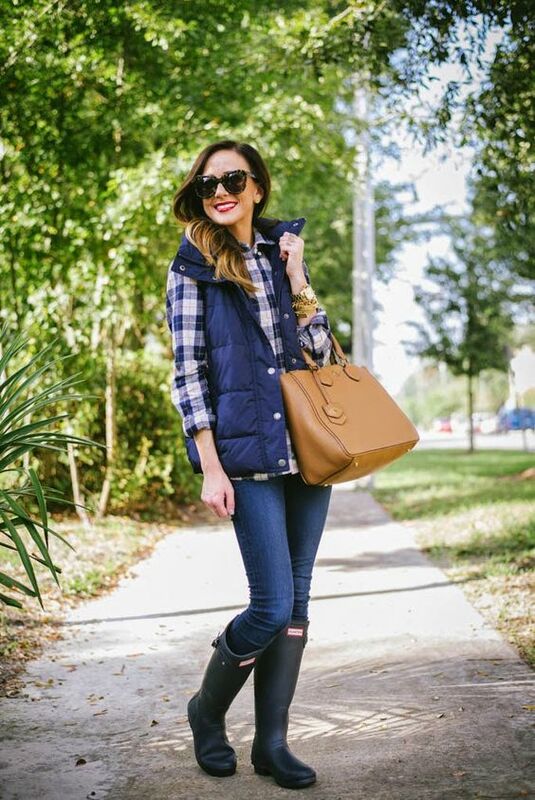 Slip on a puffer vest to layer over your plaid shirt outfit with denim jeans and hunter boots. Add a splash of color to your look by choosing a bright or contrasting accessory. Which plaid shirt style are you going to try out this season? Let us know in the comments below.